With the busyness of Summer and family and fun…and decreased productivity…this post will be brief but heartfelt. I don’t know how you feel today. Maybe all is great and life is full and sufficient and whole. You can’t believe you get the chance to nurture young souls. You may be waking up and dreading the long day ahead. Your plans to spend quality time with your kids hasn’t quite panned out. More T.V. has been watched than you’d care to admit to the American Pediatric Association. Grand adventures and homemade activities seem like too much work after late night bedtimes, whiny voices and squabbling siblings. When each child keeps begging and pleading for more of something and a friend calls for help and the housework keeps being undone instead of finished…you just want to give up. I just want to give up. Here is a vision I’ve been repainting in my own head. He is right by your side. Not only by your side…He goes before you. God is present every where at once. Therefore God is infinitely present everywhere. God is with you now. And right now? He is with you in the future. and with you in the past. He is with you in the past, present and future…at the same moment. rest in His shadow. find comfort in the building God forms around you. He fights your battles for you. You and I? We are not mothering alone. He also surrounds our children. He is with them now and with them now as adults. For Him now and future is one moment. So our fears about how our kids will turn out…in God’s view? He sees the full package: child to adult to eternity. He gives us a simple command: love them. We are only to be faithful to love. Wowzers girl. This is GOOD and this is GOD. I hope mamas all over the world read this and know this truth and live this truth. I know I needed to read it. Thank you, friend. you are sweet. it is God, right? 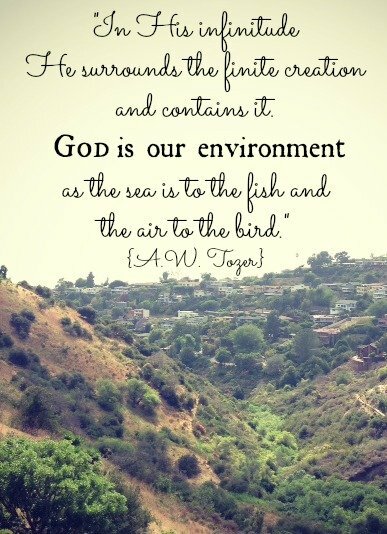 He is all around us and loves us. Hard to imagine these intangible truths. I pray with you that other moms can believe God’s got their kids covered. blessings. Beautiful message….. Simply and beautifully stated…. Thanks for encouraging weary hearts and reminding us of Him. thank you for your encouragement. He is showing me some super awesome truths about His provision. blessings. Love the encouragement through scripture–reminders that we are blanketed in His love and grace! thanks chica!! The more scripture I read the more I find it to be truly. Not only is He the center of my life but I am the center of Him. good stuff. As I hide in the closet from the beautiful whiney little angels God had given me, your post brings me renewed faith and purpose. Whew. Thank you.